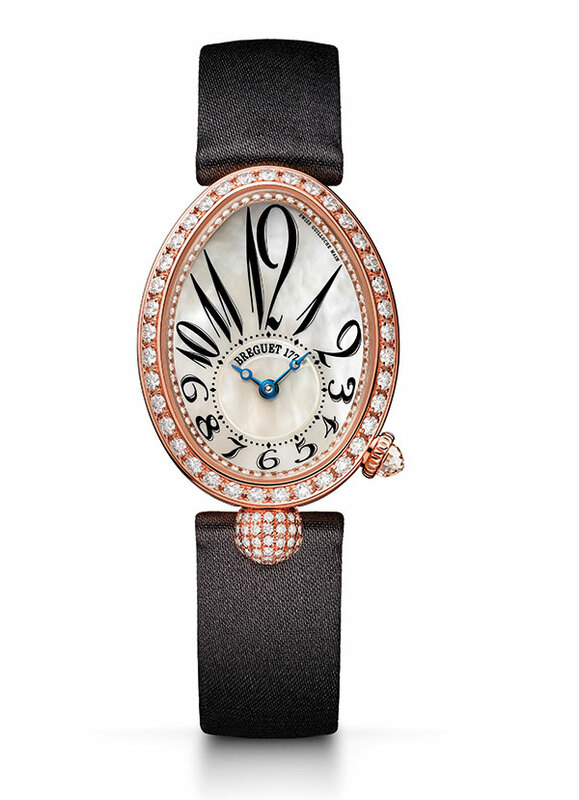 Known for their aesthetic innovation, the watchmakers at Breguet once again bring to the forefront their experience in craftsmanship and brilliance in attention to detail by crafting a case entirely set with baguette-cut diamonds. The off-centre dial plate, manually engine-turned in silvered gold, has a pear-cut diamond at 6 o’clock and mother-of-pearl rays to mark the hours. Sitting on an aficionado’s wrist in a bracelet made of Tahitian pink Akoya pearls, diamonds or a satin strap, this timepiece is for those who like indulging in the finer things in life. At a little over 30 millimetres, the Marine 8828 is perfectly sized to pair with both day and night looks. Hand-engraved on a rose engine, and set with seven diamonds, the beautiful mother-of-pearl dial sits surrounded by 74 diamonds on the bezel and lugs. Equipped with a chronograph that measures and displays lapsed times and shows conventional time too, this watch is a truly awe-inspiring piece, where technological finesse and beautiful handiwork come together to create an exceptional masterpiece. 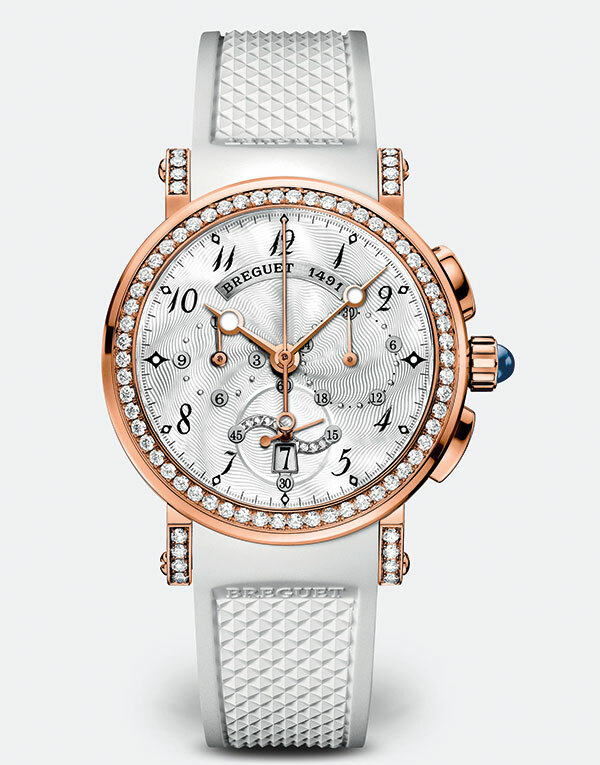 Diamonds, they say, are a woman’s best friend, and this timepiece is proof of that. A stunner whose bracelet is set with 650 diamonds, 151 baguette-cut diamonds and 11 ruby cabochons, the Reine de Naples 8909 is an impressive sparkler. Its face tells a story of its own — the silvered gold dial, hand-engraved on a rose engine, is paved with 67 diamonds, bears moon-phase indicators and is enclosed by a caseband and bezel paved with 86 baguette-cut diamonds. 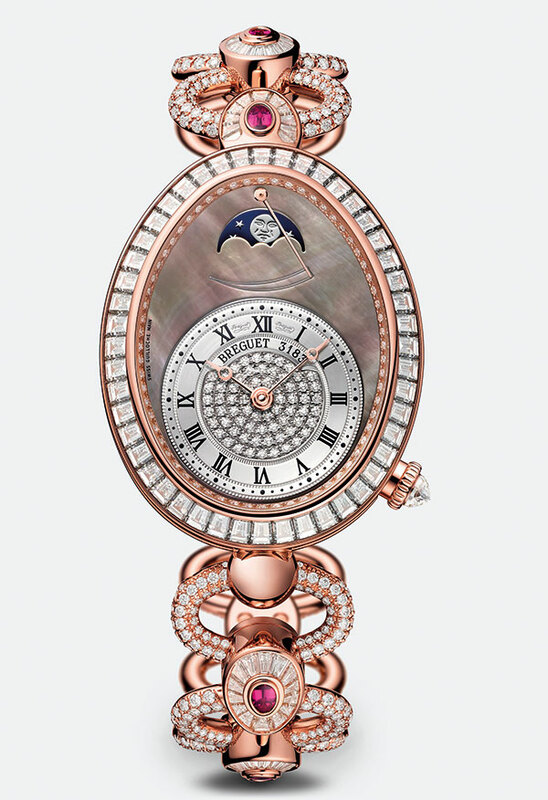 The mesmerising 18-carat rose gold oval-shaped casing of this timepiece houses an engine-turned natural mother-of-pearl dial with applied and curved Roman numerals at 6 and 12 o’clock. Tucked away beneath the dial is a self-winding numbered and signed Breguet movement, beating at a frequency of 4 Hz. Held together by either an alligator leather strap with a gold folding clasp or a rose gold bracelet with 104 brilliant-cut diamonds, the Reine de Naples 8965 is the perfect example of sophistication in simplicity. Breguet’s creations for women have always seamlessly brought together the elegance of jewellery and mechanical expertise. 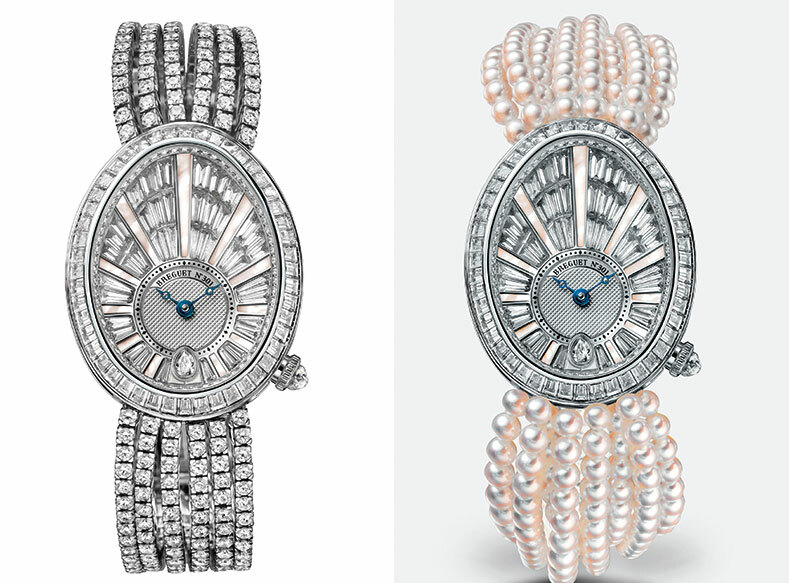 On the Perles Impériales Haute Joaillerie, a significantly large pearl sits at 6 o’clock atop the diamond encrusted bezel. ​The white gold version with an Akoya pearl ​and the rose gold one with a Tahitian pearl​ both catch your fancy — and the engine-turned motif ​that echoes the delicacy of fine embroidery can steal your heart as well. Dainty hand-guilloché on a natural white mother-of-pearl dial offset at 6 o’clock is further embellished with a pear-shape​d​ diamond. 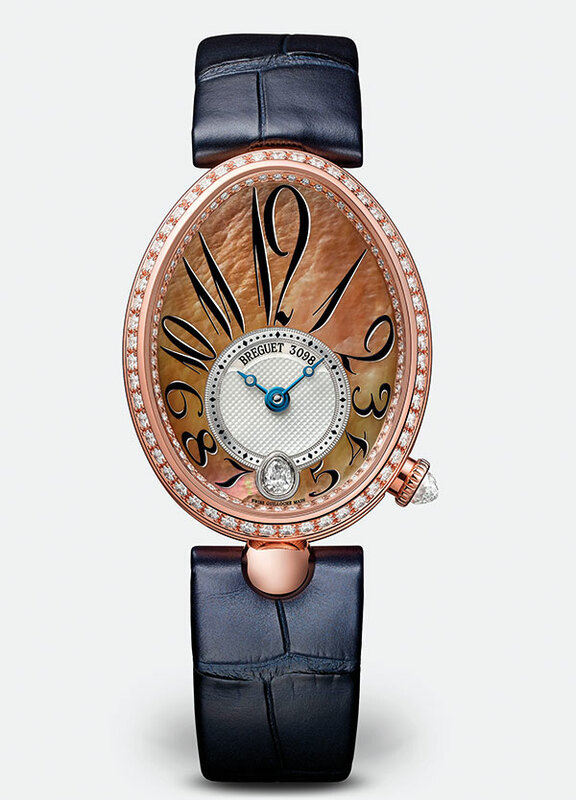 Water resistant up to 30 metres, the 18-karat rose-gold case of this watch, finished with a sapphire-crystal caseback, houses a numbered and signed Breguet self-winding movement. Adding to the sheen of this Reine de Naples 8918 are the bezel and dial flange, set with 117 brilliant-cut diamonds and crown set with a briolette diamond. 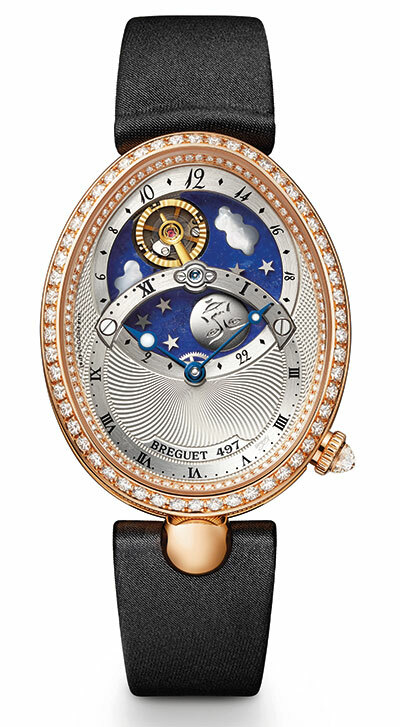 One sees poetry in motion on the face of the dial of the Breguet Reine de Naples Day/Night 8998, which brings the sun and the moon together. 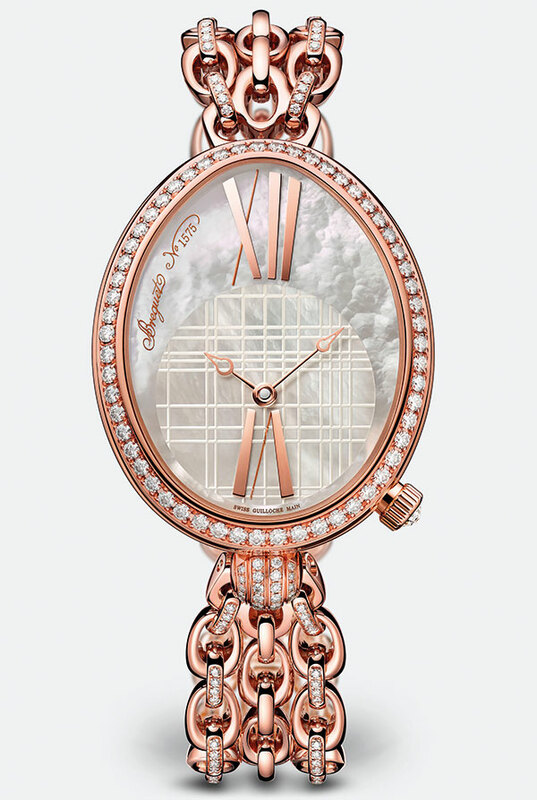 Further enriched with clouds crafted from white mother-of-pearl, stars in gold and engine-turning in flame and barleycorn patterns, the sapphire-crystal caseback offers the wearer a glimpse of the rays of the sun engraved on the winding rotor. 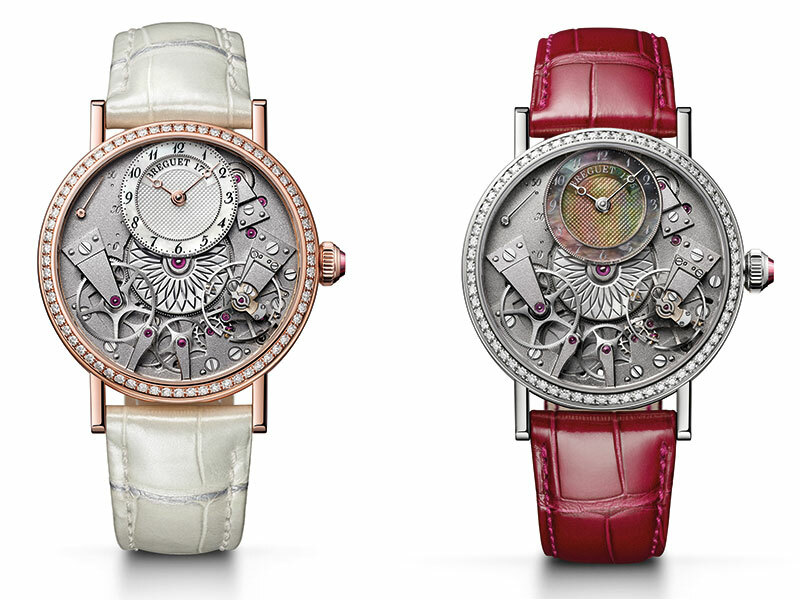 Available in an 18-carat white gold and rose gold case, this timepiece flaunts a unique melange of artistic and mechanical skills. True elegance lies not in being noticed, but in being remembered — and the delicately fluted caseband, mother-of-pearl dial offset at 12 o’clock, the Breguet open-tipped hands in gold and the hours chapter with Arabic Breguet numerals definitely find a place in the memory of all those who even just glance at it. With a decorative motif at the centre and fanciable engine-turning on the dial, retrograde seconds engraved on the movement face and an impressive 50-hour power reserve, the Tradition Dame 7038 is as powerful in performance as it is bewitching to look at. Sure to be the subject of many people’s fancy, this timepiece — at the heart of which sits a self-winding movement — has a mother-of-pearl dial and is individually numbered and signed Breguet. 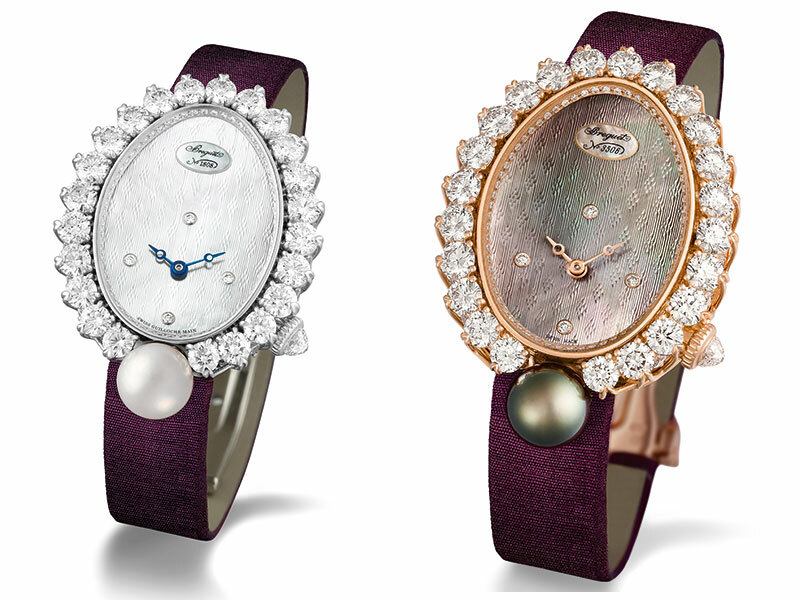 The Reine de Naples 8928 has a case that is an elegant cambered ovoid and is further enhanced by a delicately fluted caseband. The hours’ chapter with Arabic Breguet numerals offset at 6 o’clock and the signature open-tipped hands in blued steel tell the time in style while the crown set with a briolette diamond adds to the appeal of this watch.